Project 45 is the latest comic title from the mind of Kal Mebane and with influences like GI Joe, Jem and the Holograms, Transformers & ThunderCats behind it, I can’t help but think this’ll be my kind of thing. Hidden away in a secret sector of space is Tidereus Academy, an all-girl military school built into a large asteroid. The school teaches intergalactic diplomacy, assigning small groups of students, called Projects, on missions to deal with various conflicts within the galaxy. 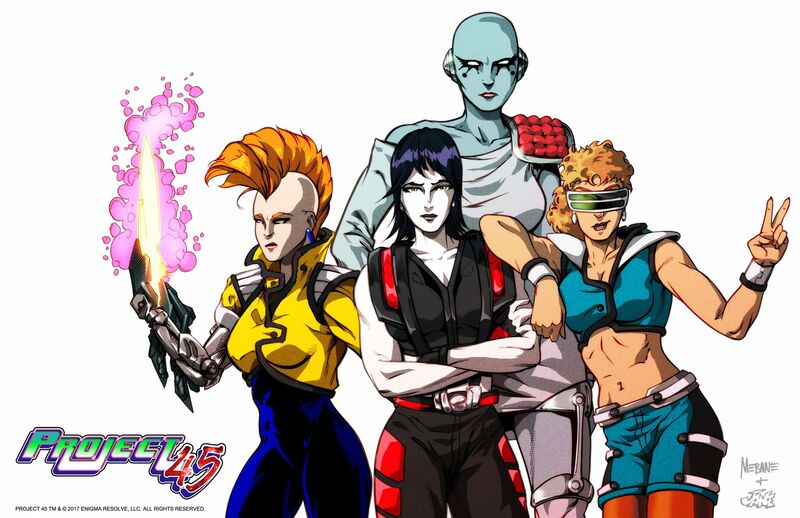 Of these groups, Project 45 is the most troubled, consisting of Beatrix, their stern leader with a dark side- Aestas, the mysterious, silent telepath- and Taura, the hotheaded mechanical genius. Their newest addition to the group is Carmen, an orphaned student transferring from a recently destroyed Earth settlement. Her telepathic powers should help her fit in, but will she ever gain the acceptance of the others? How did the idea for Project 45 come about? First off, thanks for having me back again! Project 45 was created by my sister Yelena Mebane, who is also my co-plotter, and me. We were influenced by the cartoons that we grew up watching in the 80’s like GI Joe, Jem and the Holograms, Transformers, ThunderCats, etc. I also read the comics for those cartoons and noticed that the stories were more mature than the cartoon series. My idea was to make a comic that combined what I liked about both the cartoon styles with the more mature stories of the comics. The story of Project 45 revolves around Carmen who is the first human to attend Tidereus Academy, an all girl military school where many alien species throughout the galaxy are enrolled. The students are placed in groups called Projects and sent on missions within the galaxy. Carmen is placed in Project 45 with Beatrix, Taura and Aestas, who happen to be the worst students in the school. Not only does Carmen struggle to get along with the group, but also the group struggles to pass their missions in order to graduate. Needless to say, chaos ensues! Have you had this release in mind for a while? Originally, when we chatted last year, I was working solo on my other title, Heidinger, but it finally proved far too great a task by myself. I had tons of other title ideas lying around so I thought about which one could be completed the fastest. Project 45 was the one I chose due to the way the story is written to be episodic and split up to be completed by different creative teams if necessary. 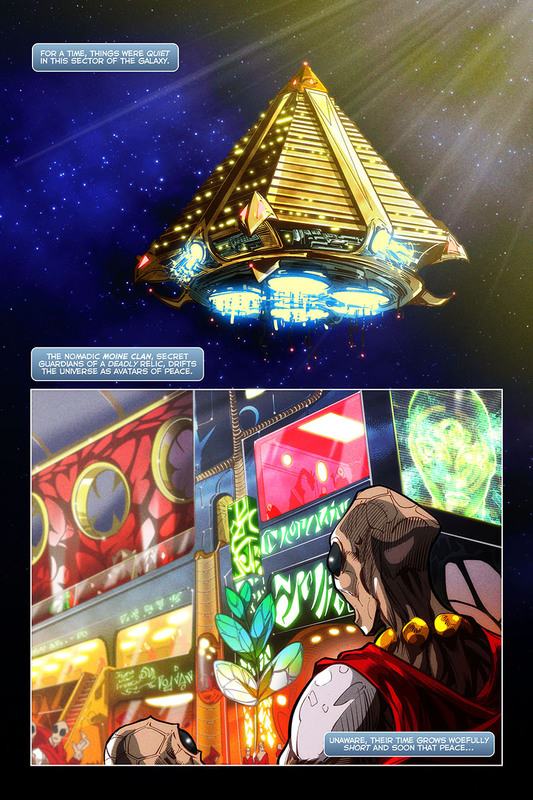 Also, the galactic nature of the story could serve as a hub for introducing all of my other titles and characters. How many issues do you see this series stretching to? The first story arc will be 4-6 issues, depending on how accurately I’ve outlined the story. It’ll definitely be ongoing but broken down into smaller stories that are connected by a larger theme. Some of the smaller bits may also be handled by different art and writer teams as well. You’re taking on lettering duties too. Has this been easy to juggle, along with everything else you’re doing for the book? No, it hasn’t been easy at all! I actually planned to do the entire book myself but it’s too time-consuming. That’s exactly why I had to split my duties and add-on guys like Jay Hernandez and Jake Isenberg to the book. Penciling is very exhausting to me so I decided to let Jay do that while I focus on the coloring and lettering myself to maintain the overall look of the book. 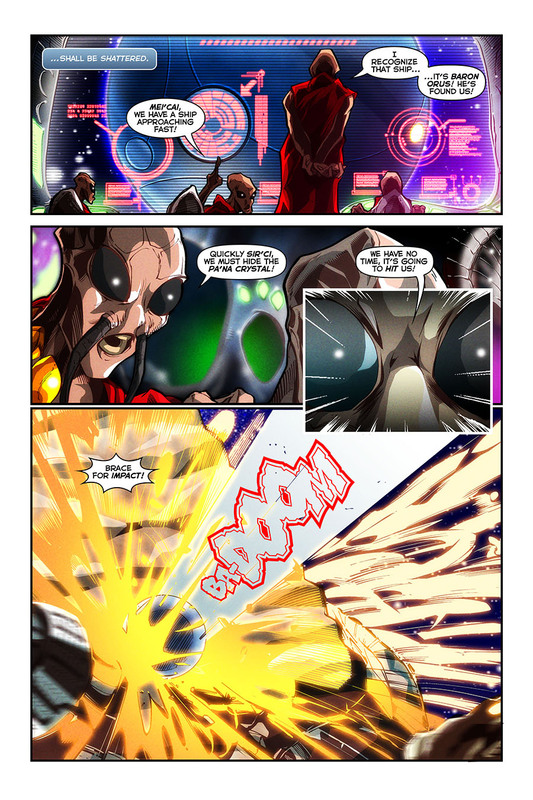 The colorist is the last person on the “art assembly line” so I get the opportunity to add a lot of influence there. I’m the Photoshop guy so I get to clean up and make changes to the pencils and inks if necessary. So, that makes me the editor too. The role of the colorist has expanded so much since the old days of painting with dyes. I personally feel that colorists will be the future comic book superstars like pencilers and writers are today. How did you team-up with Jay Hernandez & Jake Isenberg on this project? Jake and I previously worked together on something for Transformers. He was actually the penciler; I found out only later that he was primarily an inker. Jay was introduced to me by a mutual writer friend of ours. Once I saw Jay’s organic pencils, I knew it would match with Jake’s polished inking style. Having seen some of the finished pages, it does have a very polished look to it – did it end up looking like you had imagined? Thank you and honestly, yes! I look for artists who share similar styles like my own or who complement each other. I have a knack for assembling those types of creative teams. Since Project 45 is influenced by 80’s animation, I had a specific look in mind and I brought together a team that could naturally achieve that look. What can we expect from the Project 45 book? Expect all of the alien worlds, drama, action, romance, conspiracies, plot twists, etc. of the typical sci-fi space opera genre, yet with a light-hearted “academic” atmosphere. Most of all, expect character growth within well-constructed adventure stories. Project 45 takes up the majority of my focus now. My other book, Heidinger, has been put on hiatus but I still chip away at it from time to time. I’ll be resuming that one once the first Project 45 story arc has been completed. I also update much of what I do on my website, which also links to my Facebook, Twitter, YouTube, etc. If you want to keep current, I can be found at WWW.ENIGMARESOLVE.COM. BIG thank you to Kal for catching-up with me and we’ll hopefully hear more about Project 45 soon. 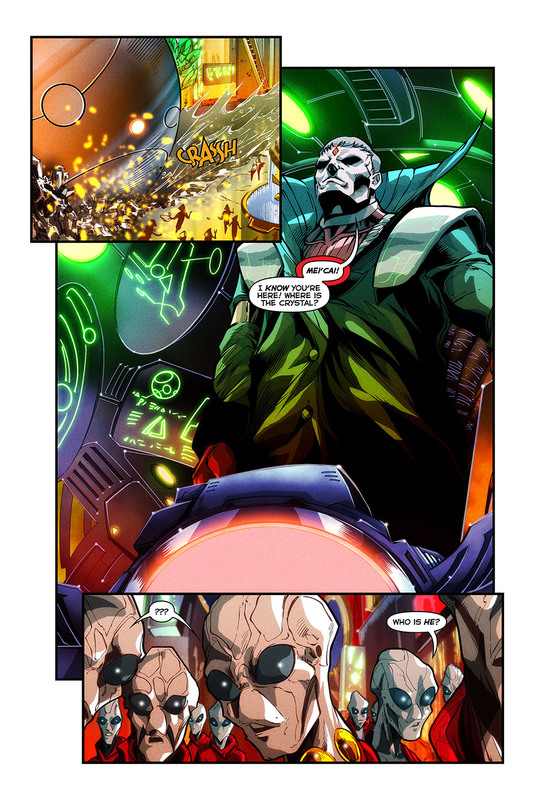 This entry was posted in Comic Previews, Interviews and tagged Enigma Resolve, Joey Saucedo, Kal Mebane, Project 45, Yelena Mebane by G-Man. Bookmark the permalink.